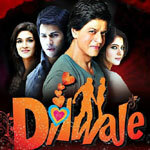 "Dilwale" is a 2015 hindi film which has Shah Rukh Khan, Kajol, Varun Dhawan, Kriti Sanon, Varun Sharma, Chetna Pande, Vinod Khanna, Kabir Bedi, Johny Lever, Boman Irani, Sanjay Mishra, Mukesh Tiwari, Murli Sharma, Pankaj Tripathi, Nawab Shah and Shawar Ali in lead roles. We have 2 songs lyrics and one video song of Dilwale. Pritam Chakraborty has composed its music. Arijit Singh, Amit Mishra, Anushka Manchanda and Antra Mitra have sung these songs while Amitabh Bhattacharya has penned its lyrics.